You are here: Home / Live / shop update :: an organized 2015! shop update :: an organized 2015! this is the perfect time to get organized for a brand new year. a fresh start! 2015 has a lot of potential – my mind is on overdrive thinking of all the places in which i can improve myself and my life and i can’t wait to jot it all in so i can start getting to work! i’ve added a few things to my etsy shop that might help you in your goal to be a more organized person this year, too…. 1. 2015 monthly calendar set. this was our most popular item last year (the 2014 version, of course!). it’s fun and it’s clean-looking, and it’s great for planning out everything from dinner menus to busy schedules. it looks great on a fridge or bulletin/magnetic board for your whole family to see, or hole-punched and tucked away in a binder. 2. 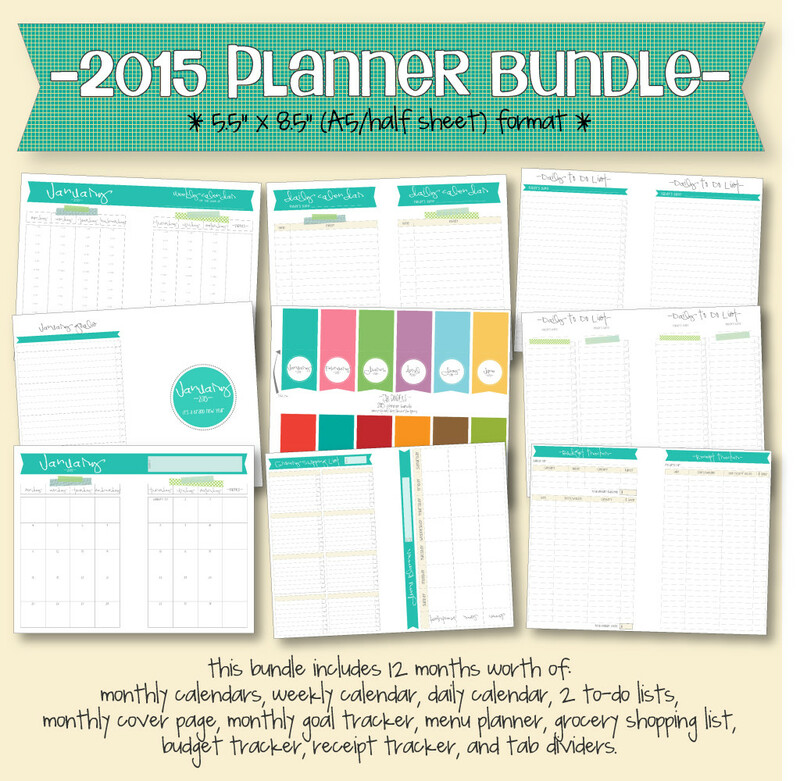 2015 planner bundle (A5/half-sheet size). another popular post on our blog is the DIY planner/journal/notebook made from a cereal box. it’s so easy to make and costs next to nothing. people liked this, and so i added a free printable monthly calendar to go along with it each year. seeing as *i* needed some more organizational sheets to go along with the monthly calendar, i recently put together this planner bundle in the same size – the PDFs print out onto regular 8.5″ x 11″ paper and then you just need to cut them in half and punch holes to fit in your DIY planner. this set includes: a daily calendar, weekly calendar, monthly calendar, monthly goal tracker, 2 to-do lists, menu planner, grocery shopping list, budget tracker, receipt tracker, monthly cover page, and monthly tab dividers. pick and choose which ones you’d like to use each month, and print off as many as you need to keep yourself organized! 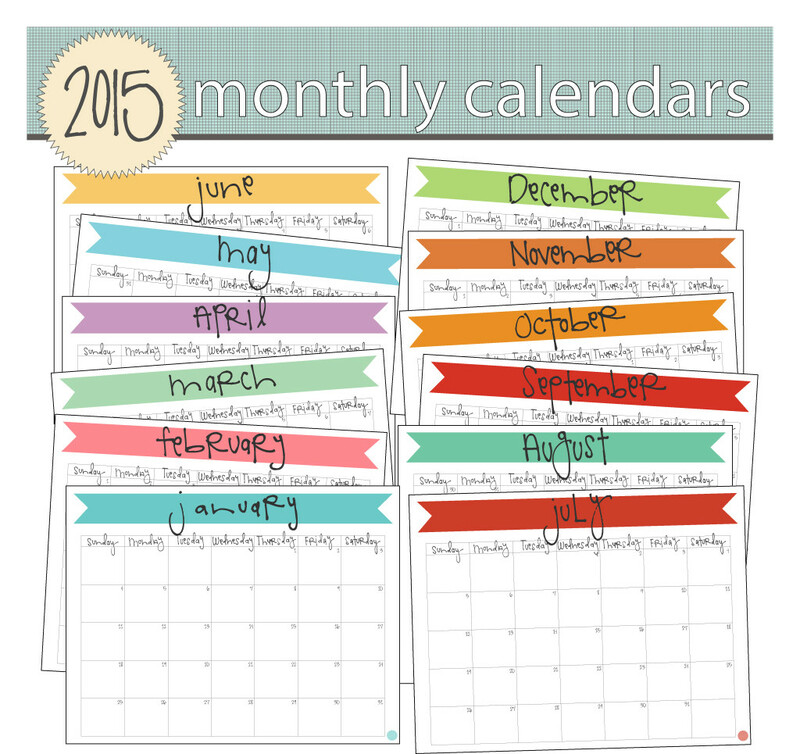 each month has it’s own designated color and each month has all the printables listed above. 3. 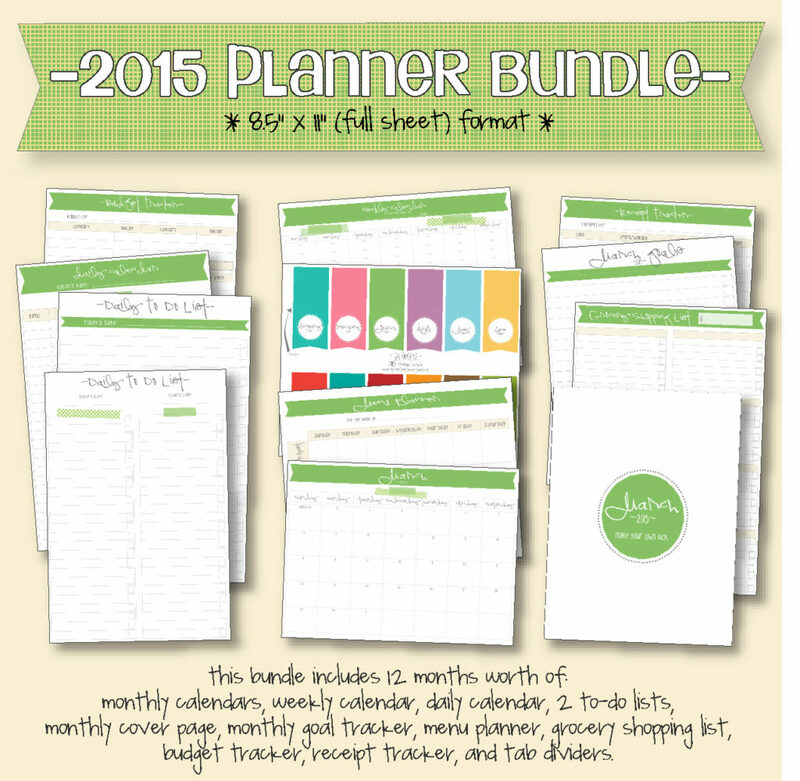 2015 planner bundle (8.5″ x 11″). similar to the planner bundle above, this has so many things that will help you stay organized this year! it includes all the same organizational sheets, the only difference is in the size – these print out at a full 8.5″ x 11″. they’re great for putting in a regular size binder and keeping on a bookshelf or on a counter top. there is a little bit more space to write since the pages are larger, so if you have big writing (like me!) this might be the way to go! grab your printer and a favorite pen, and you’re ready…set…organize! 4. weekly menu planner. this one has also been really popular – who doesn’t love having a whole week’s worth (or more!) of meals planned out!? no more running to the store every day or two to buy more and more food and spend more and more money. these make it easy to plan out breakfasts, lunches, and dinners. it also has a place to write all the groceries you need so you only buy what you’re planning on eating that week. it’s a great way to be stress-free and to keep more money in your wallet. 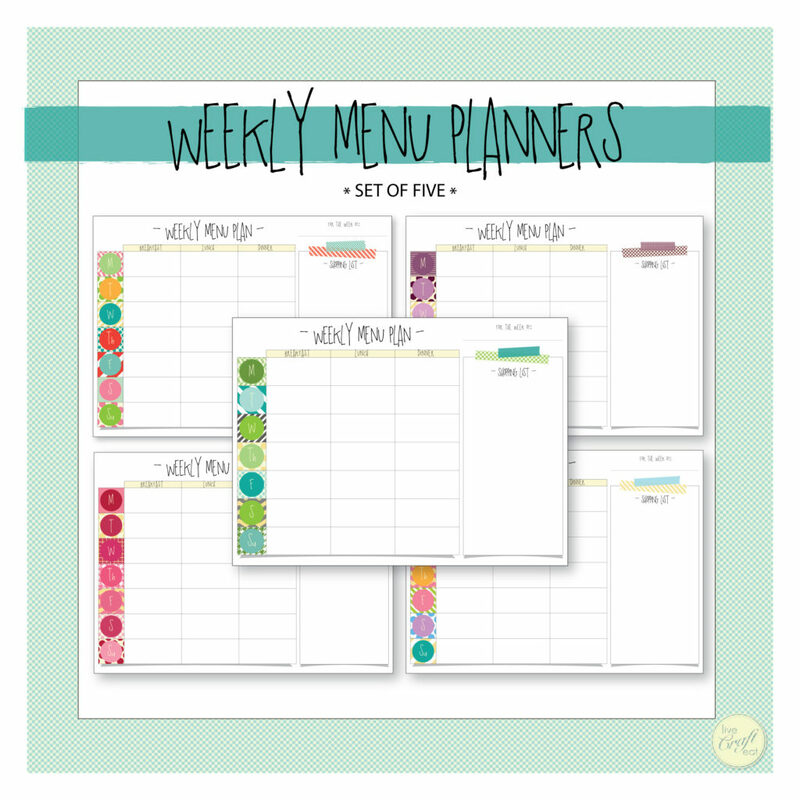 this set comes with 5 different color/patterned weekly menu planners. print them all out, or just use your favorite one(s). to see how i put together my own bound menu planner (and for a free printable menu-planning stickers printable! ), visit my post here: how and why i menu plan. 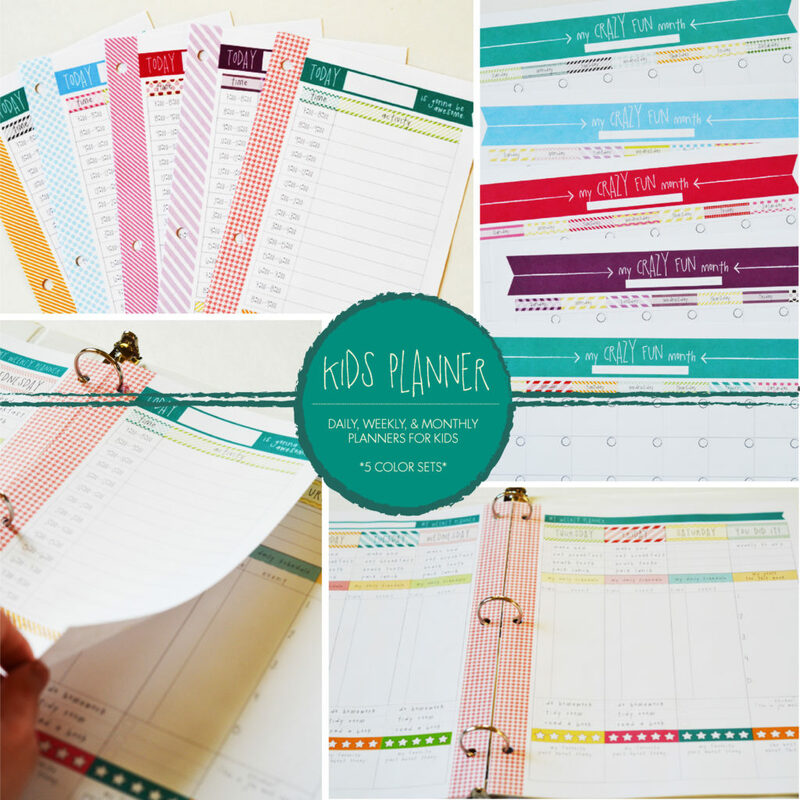 5. kids daily, weekly, & monthly planner. this one is fun because it’s just for kids! once my kids started school and sports they thrived on having a schedule because they knew what to expect and there were no surprises. this set includes the following items in 5 color/pattern styles. you get all 5, and then you can just print whatever you (and your kids) like! monthly calendar pages – a simple overview of everything your child has going on during the month – birthday parties, t-ball games, etc. place everything in a regular-sized binder and you’re set! to see how i put one together, visit this post here: daily, weekly, monthly planner pages for kids. 5 different ways to help yourself and your family become and stay organized this year! I am not able to find your shop on etsy. 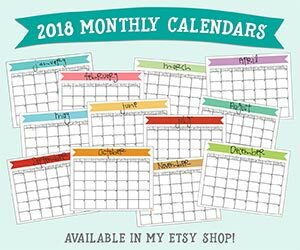 How do I find you to get your free printable calendars, etc? I love the look of them. Thank you. I don’t have free printables on there, but do have free printable monthly calendars on my blog and I post a new one every month. You can go to my homepage, http://www.livecrafteat.com and there should be the newest free printable on the sidebar, or you can scroll down until you find the most recent month.